Raj Babbar's candidature was earlier announced from Moradabad. The Congress on Saturday declared 34 more candidates for the Lok Sabha polls. 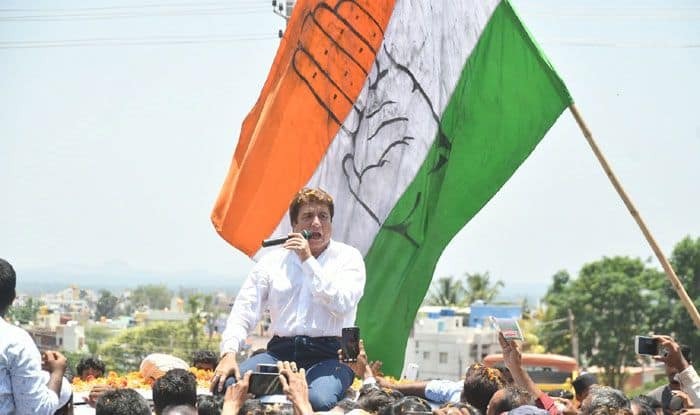 The Congress on Saturday declared 34 more candidates for the Lok Sabha polls, fielding Uttar Pradesh unit chief Raj Babbar from Fatehpur Sikri, whose candidature was earlier announced from Moradabad. The party has also fielded former Union Minister Renuka Chowdhury from Khammam parliamentary constituency in Telangana while the son of veteran Congress leader Karan Singh, Vikramaditya Singh, will stand from Udhampur (Jammu and Kashmir) against Union Minister Jitendra Singh. Eight names figured in the list of candidates for Tamil Nadu which includes two former state party heads Su Thirunavukkarasar (Tiruchirappalli) and EVKS Elangovan (Theni). The other six are K. Jayakumar (Tiruvallur), A. Chellakumar (Krishnagiri), MK Vishnu Prasad (Arani), Selvi Jothi Mani (Karur), Manickam Tagore (Virudhunagar) and H. Vasanthakumar (Kanyakumari). As part of the DMK-led alliance, the Congress got a total of 10 Lok Sabha seats — nine in Tamil Nadu and the lone Puducherry seat. The party has reposed its faith in Renuka Chowdhury. In Telangana, the party had earlier announced candidates for 16 seats and only Khammam was pending which has now been given to Chowdhury. Her name was announced a day after Telangana Rashtra Samithi (TRS) fielded Nama Nageswara Rao from Khammam. He quit the Telugu Desam Party (TDP) and joined the TRS. Chowdhury, who was elected from Khammam in 1999 and 2004, lost to Nageswara Rao of the TDP in 2009.